The stream's water level dropped by several inches after a lot of water weed, sticks and leaves were removed. The water weed was wheel-barrowed away to go into the recently built compost bins at the allotments. Having removed most of the overhanging vegetation several volunteers dug out the deep silt from the bottom of the stream to improve the water flow. We also removed two large branches which had fallen down and were blocking the start of the stream. Children seemed to outnumber the adult volunteers at the stream clean-up until the novelty factor was satisfied - this lasted roughly an hour! -after which the children vanished into the playground! Luckily this year, unlike last year, no-one fell in! 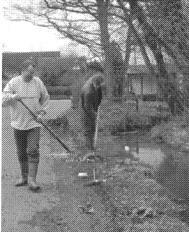 Having worked hard for several hours we managed to clean the stream and tidy up the weed and debris by lunch-time. With aching backs and sore muscles we went to the Plough and enjoyed our reward - sandwiches and chips  before those who had the energy helped finish off the clean-up at the cemetery and playground. 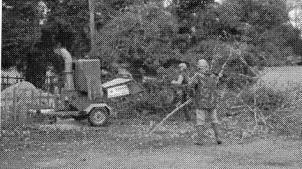 The work in the cemetery and car park was planned by Graham Darrah, as tree warden. He drew up a scheme for trimming and in some cases felling unwanted or poorly grown trees. The plan was agreed by Middleton Estate, which owns the car park, and by TVBC Planning Department. The Parish Council agreed to pay for some professional help, which was invaluable in achieving much of the programme in just one day. Richard Fry of Sunshine Landscapes brought his large shredder, which tireless volunteers kept supplied with material produced by the four skilled chainsaw operators, Richard Fry, Paul Knipe, David Harris and John Ellicock. Work continued until the evening, and David Harris very kindly came back in the week with a chipper to finish the job in the car park. It is hoped to use some of the chips to improve the surface of the footpaths in the Lower Mill field. The shreddings in the cemetery, near the shed, are free to anyone who can use them. The stream, the cemetery and the car park are looking a lot tidier now. Thanks again to everyone who worked so hard and please could you all help again next year! In March the Wives Group held an open meeting in Longparish Village Hall. An audience of forty people watched a slide show, A Year on the River Test given by Geoff Dunford assisted by Nick Dunford on the projector. Geoff gave a lively and informative commentary. The slides had been taken several years ago this enabled people to see the Parish environs and characters that many members remembered. Geoff also treated us to a few amusing personal anecdotes. After the slide show there was an opportunity to ask Geoff a few questions. Delicious home made refreshments then followed and judging by the chatter in the Hall the evening was enjoyed by everyone present. Our thanks are extended to Geoff and Nick for a most enjoyable evening. The next meeting of the group will be at 7.30pm on May 17th at Woodstock by kind permission of Daphne Bevan. Members are asked to bring along a poem/ limerick they have written, or a poem, a few lines or even a few verses that have inspired or amused them at some time. Please bring your diary, as a date needs to be made for a theatre visit in June. There will also be a Bring and Buy sale.